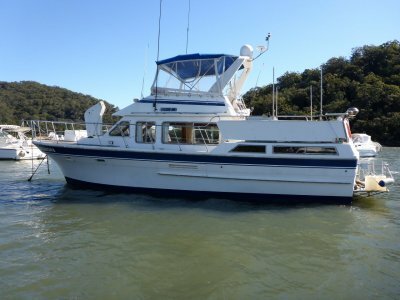 Anyone interested in a Ranger, Island Gypsy, Grand Banks, or Choy Lee should view this outstanding vessel. 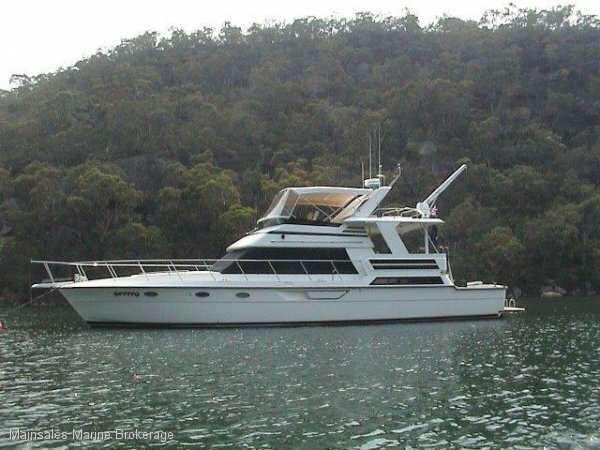 If an aft cabin with island king size bed, twin ensuite, large saloon, air conditioning, separate guest accommodation, spacious galley, safe walk around decks, numerous entertaining areas, well maintained diesel shaft drive flybridge cruiser and a 12 KVA genset are on your "shopping list" we are pleased to offer this well appointed Yachtfisher that ticks all of those boxes. 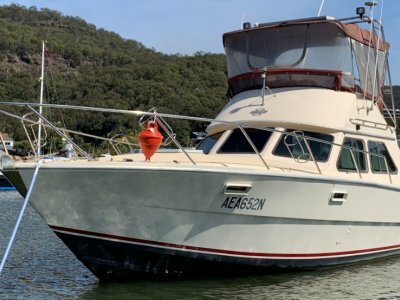 From the moment one boards "Boy-O-Buoy" you'll be impressed with the commitment the owners have to quality relaxation, entertaining and maintenance. Whether you're looking for a live aboard, a comfortable coastal cruiser or an idyllic place to escape the madness "Boy-O-Buoy" should satisfy your needs. 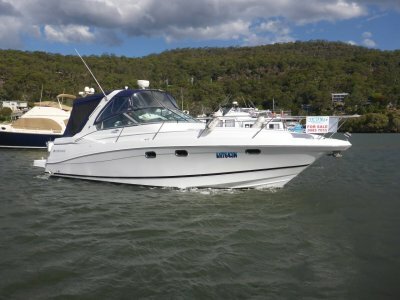 Built by Dynacraft in 1991 the Dyna 53' Yachtfisher offers easy on board access from the swim platform through a transom door to its spacious cockpit, with manageable steps to the large aft deck from which easy access is gained to the flybridge and saloon or forward via wide walk around decks. Below decks are airy and sun drenched offering 2 very comfortable sleeping cabins with the owner's aft stateroom boasting an island king size bed, adequate drawers and storage, a lounge and a well appointed ensuite. The bright forward cabin has excellent ventilation with the option of four single beds or a V-berth with 2 singles, generous storage areas and its own ensuite. The starboard galley has ample bench space with sufficient storage and has seen many a meal prepared for the guests. Inclusions are a fridge with freezer, microwave, 3 electric hotplates, oven, a dual sink. Opposite the galley is a separate dining area comfortably seating a large family which easily converts to a large spacious berth. The sun drenched saloon has large sliding windows offering plenty of ventilation with an abundance of natural light. The comfortable lounge will hug and relax the body while enjoying the luxury of an Ocean Satellite system including Foxtel or listening to your favourite tunes via an Ipod dock. The aft deck could easily pass as a dance floor with the hardtop offering great protection from the elements. You would be pressed to find a more enjoyable location to enjoy a well-earned drink watching the sun set while cooking the days catch on the BBQ. The flybridge offers excellent visibility with a pilot seat alongside the helm seat and plenty of seating ensuring the skipper will never be lonely while on watch. Full clears and bimini are in great shape offering all weather usage of the flybridge. With an inventory of a Raytheon GPS, Raytheon Auto Pilot, Raytheon sounder, VHF radio, 3 mtr inflatable with a 5 hp 4 stroke outboard, air conditioning, aft deck spotlight, deck & anchor wash, Davco Davit, a Maxwell 1200 winch in the aft cockpit (assisting in ease of docking), remote anchor winch etc, etc. The large accessible engine room contains twin Detroit 671TA's engines (STRAIGHT 6 ) each producing 485 hp showing approximately 1,460 hours at time of listing. Offering a cruising speed of 18-20 knots with approximately 24 knots at WOT. The 12 KVA genset has approximately 1,675 hours and produces adequate 240 volts. 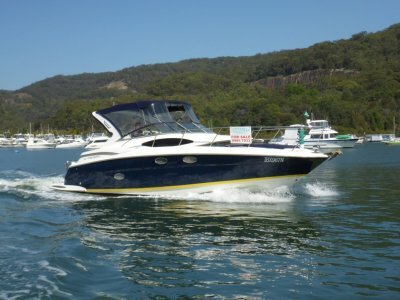 Twin Disc gearbox, Hydraulic steering and electronic controls assist in the manoeuvrability of this outstanding vessel. The swim platform is safe for boarding, fishing and with a retractable ladder in and out of the water is a breeze. Antifouling and propspeed completed 1/06/2018. Summarizing "Boy-O-Buoy" I'd confidently say "She is most accommodating, well loved, with lots to offer and above all has come from a good home. " We encourage you to make an appointment and view this outstanding vessel. 3M inflatable with electric Davco davit crane. Bimini top with envelope and clears in good condition. Spaciuos aft cabin has King size bed and ensuite. Forward cabin has 4 x singles with lower converting to V-berth if needed. 2 plus 1 built into cockpit. All hot and cold. Foxtel ocean satelitte with cd/stereo/radio. Starboard galley with ample bench space and storage. 3 electric hotplates along with BBQ at aft deck. Anti fouled completed 1/06/2018 with "propspeed" applied to both props and shafts.